Looking for a place away from mainstream travel destinations? One that offers rich history and preserved local culture? What about outdoor activities paired with a beautiful untouched landscape? If you can believe it, there is such a place. And it’s called Central Java. 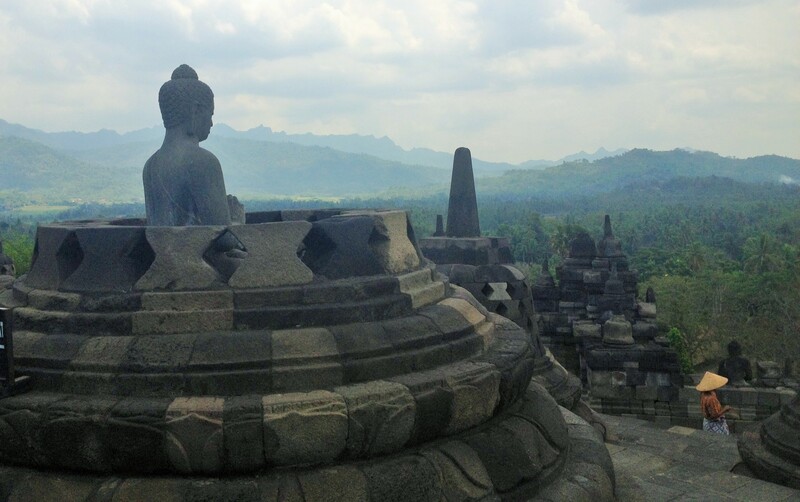 The area near Borobudur in Central Java is spectacular to say the least. Not only does it house the largest Buddhist monument in the world, but it also has one of the most stunning landscapes in Southeast Asia. Rice paddies, sprawling green fields and trees make up the terrain, all overlooked by volcanoes and peaks. It offers a travelers dream package: history + culture + scenery + outdoor activities all at a very affordable price and inhabited by extraordinarily nice people. 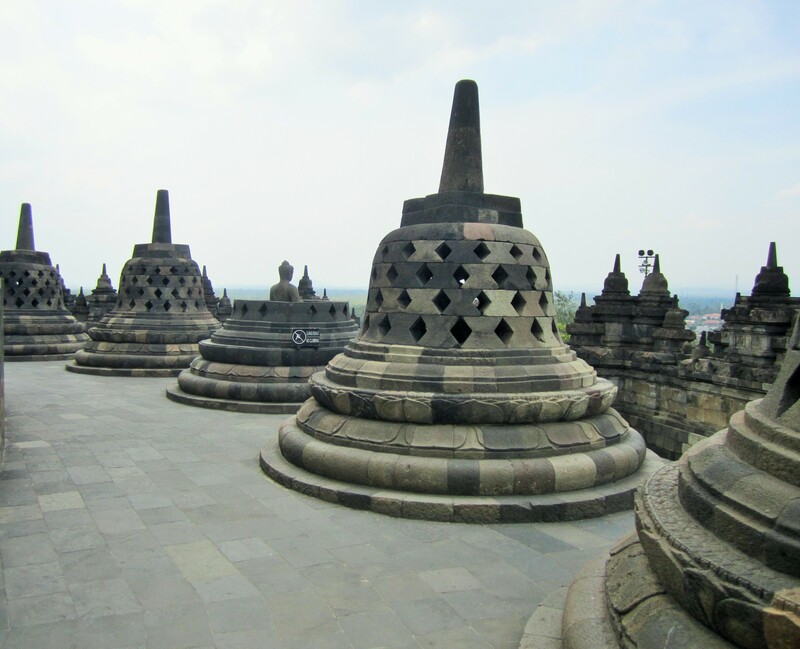 It’s feasible to get to as well, as you can fly directly into the Yogyakarta airport in Java, taking a bus or car to Borobudur about an hour away. If you’re looking for something out of the box, look no further. After traveling throughout Asia for the past few years, Central Java continues to be one of, if not my favorite trip to date. 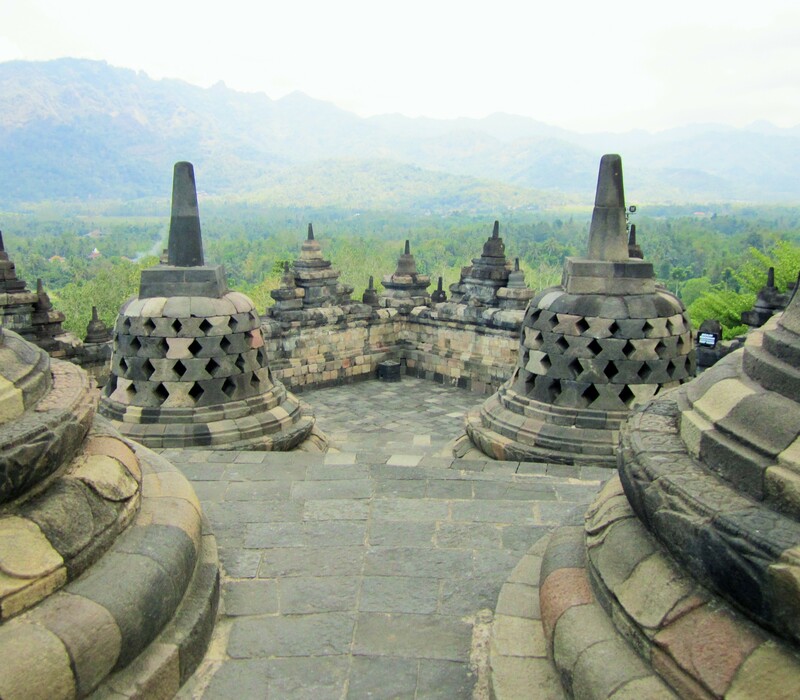 Temples: The main attraction and reason that people visit Central Java is to see the Borobudur Temple, the largest Buddhist monument and temple in existence. Built in the 8th century and named a World Heritage Site, it’s no wonder that people travel far and wide to come here. Made up of over two million stone blocks and built in three tiers, the sheer size of the temple is striking. Not to mention that it’s built on top of a hill, overlooking rolling green hills and terrain. You could spend hours examining the structure of the temple, especially the 72 stupas at the top, each containing a statue of Buddha. However, what stood out most were the impeccable carvings throughout the temples’ walls that told the stories of Buddah: his birth, teachings and principles, and search for Nirvana. There are over 2,500 reliefs that depict these stories and strikingly, most are still intact. We hired a guide to show us around the temple, as he could explain the history and help us to understand the meaning and stories behind the carvings. If you go to Borobudur, I would recommend hiring a guide, as hearing the stories of Buddah while touring the temple greatly amplifies the experience. 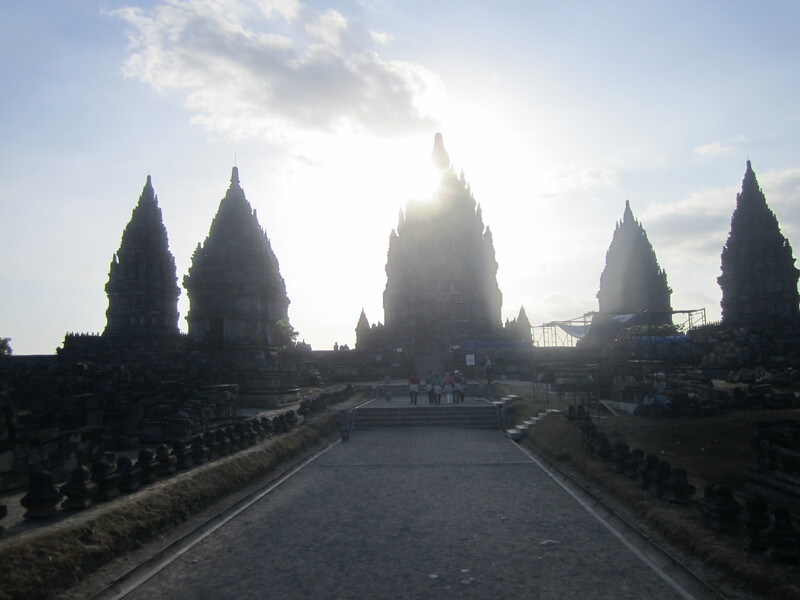 The other prominent temple in Central Java is Prambanan, the largest Hindu temple in Indonesia. 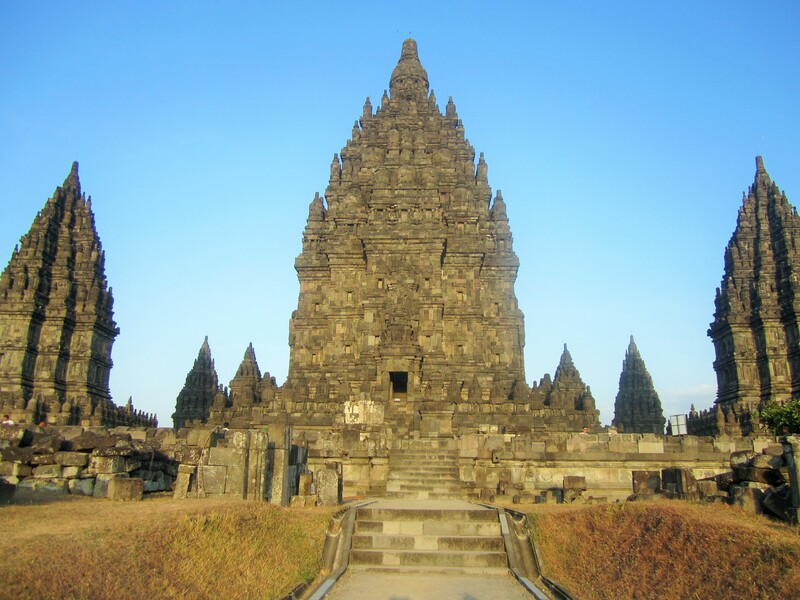 Built in the 9th century, it is equally as omniscient as Borobudor however its structure is very different. Typical of Hindu architecture, the temple is made up of tall and pointed structures that were designed to mimic Meru, a sacred mountain in Hinduism. Originally, there were 240 temples in the compound when it was built, however many have collapsed or deteriorated due to earthquakes and natural disasters in the area. The main shrine though, the Shiva Temple, is still intact. Now, I know if you’ve lived in Asia or traveled extensively throughout Southeast Asia, you have probably seen an array of temples. That said, both these temples, especially Borobudor, are beyond any temple I have ever seen. The pure grandness of the structures combined with the meticulously carved depictions of Buddhist and Hindu culture make these temples world wonders and a must-see if you’re in Southeast Asia. 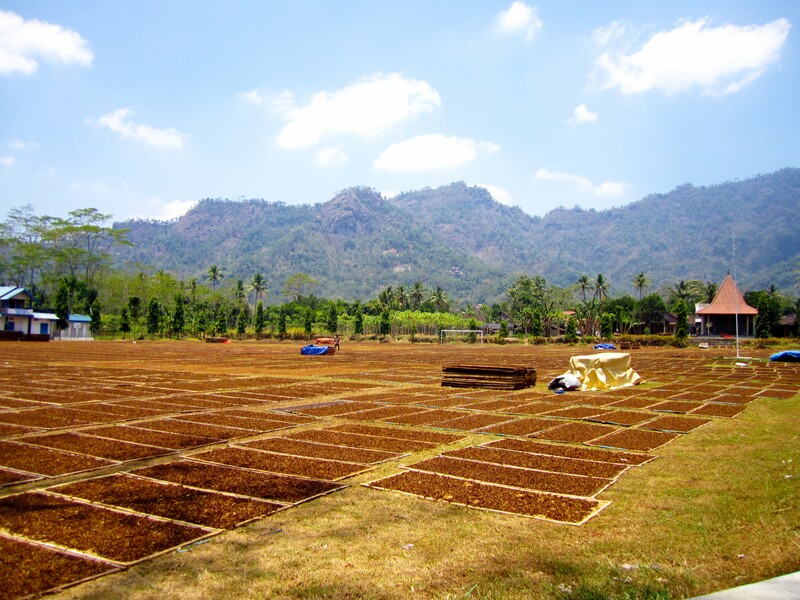 Outdoor activities: While most people come to Central Java to see Borobudur, don’t turn away just yet! You can easily spend multiple days here – and we did. 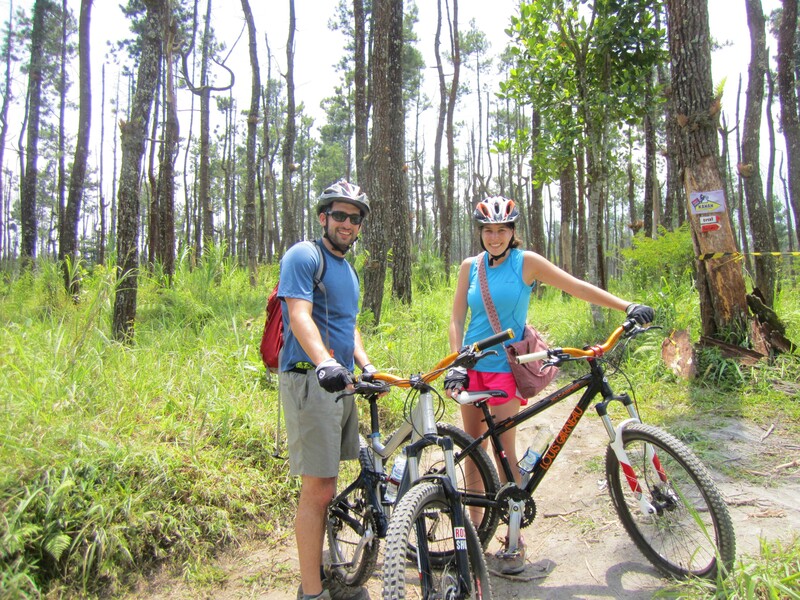 One of the best ways to see the beautiful Javanese landscape is by biking. Whether you’re an experienced biker or not, there are a variety of trails you can take that accommodate for varying levels of difficulty. To be fair, I know this because we hired a guide to take us mountain biking up Mount Merapi, an active volcano in Central Java. However after minutes of struggling to move two feet uphill, our guide graciously found a more intermediate trail for us (one that didn’t make us break out in sweat after 30 seconds!). But if you are a mountain biker, Mt. Merapi is the trail for you. We hired a guide through our hotel, however, there are many sites and tours to contact if your hotel doesn’t offer this. Given the steep and mountainous terrain, it is recommended to hire a guide as there aren’t clear cut trails or biking paths in the area. To me, this was the best way to fully experience Central Java, as we rode through rice paddies, tobacco fields, villages and mountains, getting a good picture of the landscape in just a few hours. 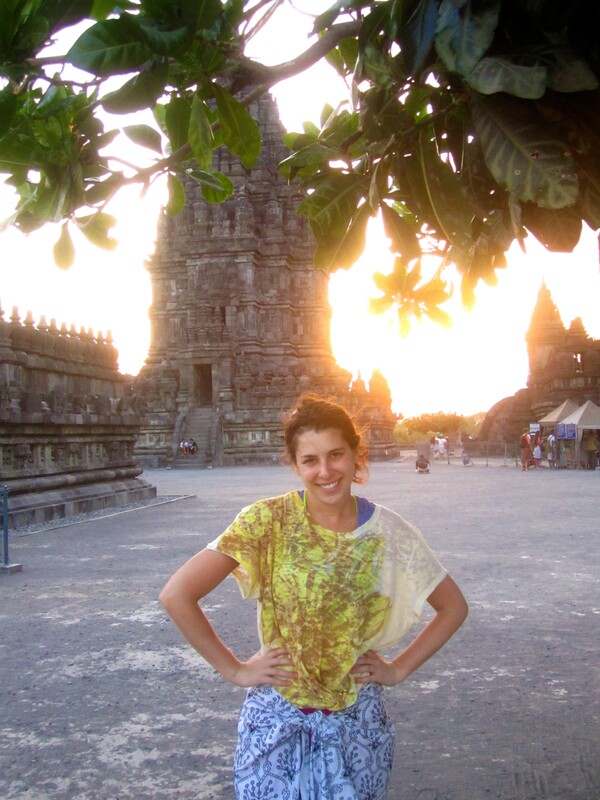 Another highlight of the trip was hiking up a mountain in Magelang, an area next to Borobudor where we stayed. While not the most challenging of hikes, it provided the best aerial views and also gave us a glimpse into village life in Magelang. On our hike, we encountered many locals bringing food up the mountain to their village at the top of the hill, which didn’t have a surplus of goods. One image that always sticks out to me is the sight of two elderly women walking up the mountain with baskets of fruits and vegetables tied to their backs. They were so hunched over that their faces were nearly at their knees while walking at a pace of fifteen feet per minute, if that. As our guide told us, these women would go up and down the mountain every day, gathering produce to sell to the village or bring to their families. This was the only produce the village would receive, and despite their age and physique, it was the job of these elderly women to provide these goods. It was a striking and symbolic image that sticks out to me. Once we reached the top of the hike, we were lucky enough to be invited into a woman’s home for tea and snacks (pre-arranged by our guide and hotel). 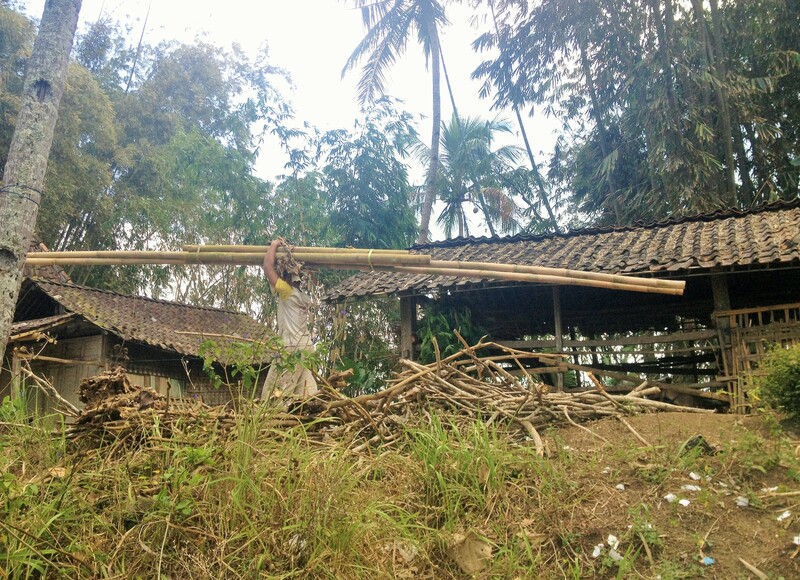 Made of concrete, her home was one of the nicer ones in the village; others were made of bamboo. It was bare – just a table and a TV – but it sat on top of a hill overlooking Borobudur, arguably the best view in the village. 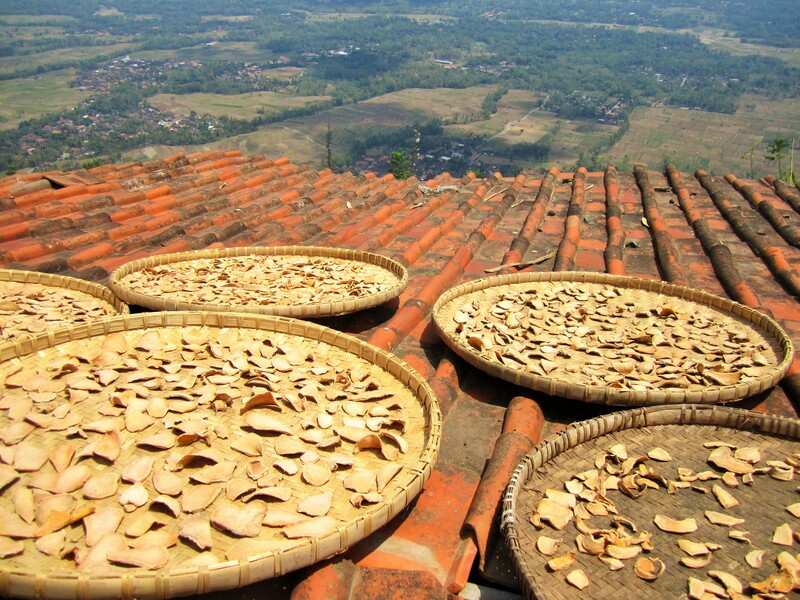 Outside, she had baskets of herbal medicines and chilies sitting out to dry, which she would sell to the community. 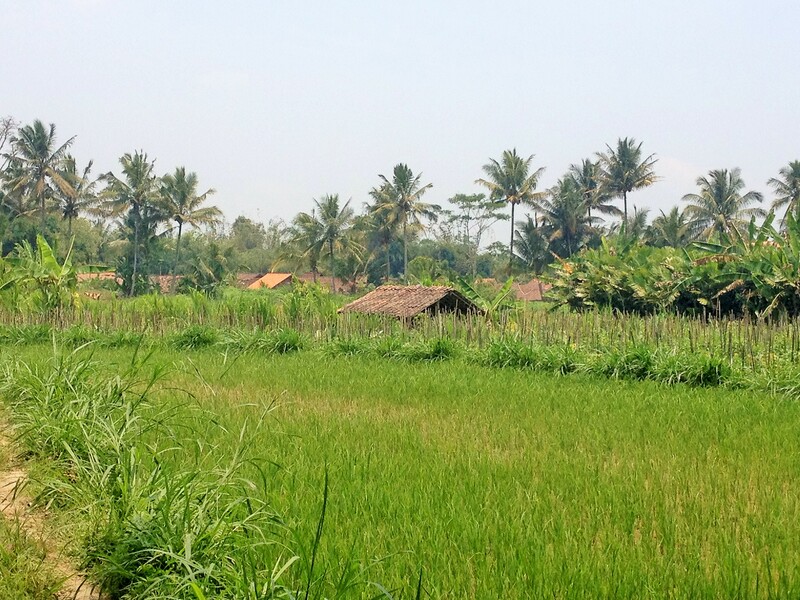 Getting a taste of Javanese village life along with biking through the countryside is what made our trip to Central Java so special. It provided an adventure away from mainstream tourist sites while also offering a rich culture of history and tradition. The list goes on of activities to do such as elephant riding, rafting, visiting waterfalls and exploring local markets. With the beauty of Central Java at your fingertips, you can’t go wrong regardless of what you choose to do. Where to stay: If the above doesn’t convince you to consider a trip to Borobudur, I hope Villa Borobudur will. 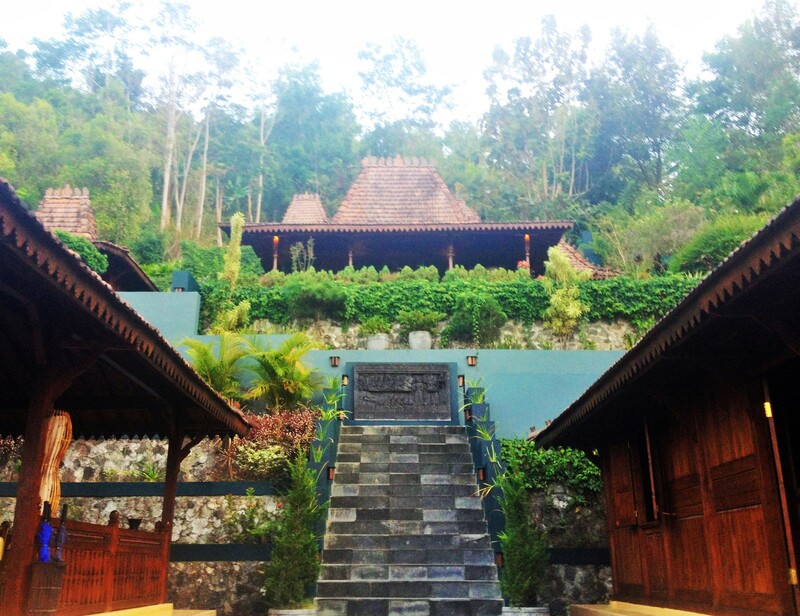 It is a stunning private estate overlooking Borobudur with breathtaking views of volcanoes Merapi, Merbabu and Sumbing. Guests stay in ornate villas that are not only spacious and luxurious, but are built to align with traditional Javanese architecture. Rooms are filled with locally sourced and handcrafted furniture and arts – at times I felt that I was staying in a Javanese museum as opposed to a hotel. The best part of Villa Borobudur is the staff. Not only did the team help us to set up and plan our daily activities, but they also guided us along the way, going above and beyond to provide insight into the city and ensure our day was a success. 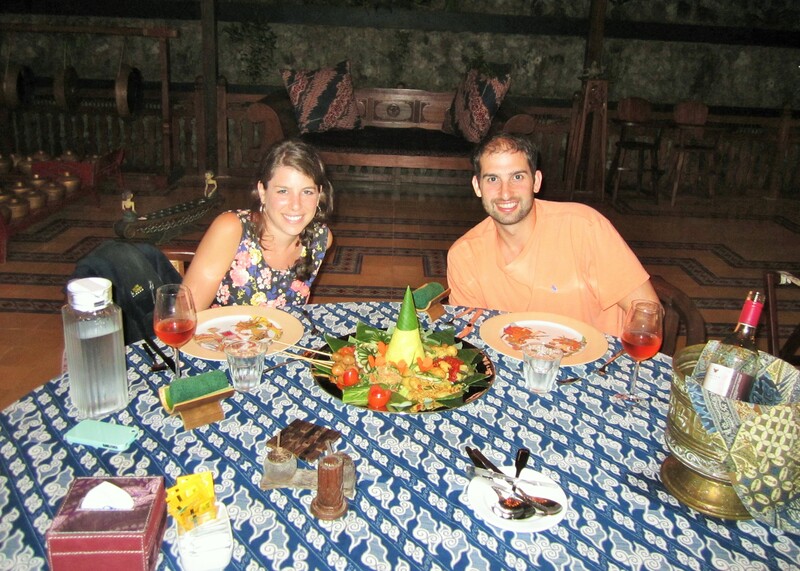 When Matt and I were the only ones in the dining room one night, the chef made us a special Javanese meal called Tumpeng that’s only served during celebratory occasions. It’s a traditional dish of cone-shaped rice surrounded by meats and vegetables. It was easily one of our best meals of the trip. Before going to Central Java, we didn’t know anyone who had been and were unsure of what we would encounter. However, given the feasibility to get there and affordability once you’re there, I find it surprising that it is still under the radar. It’s a good thing though because the authenticity and preservation of the Javanese culture and sacred environment is what makes the trip so unique. If you’re looking for a travel experience off the beaten path, Central Java is the place to go.